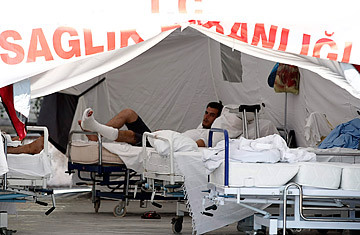 The white-haired, 61-year old exile has come to the hospital to see the refugees from Syria. He used to be a diehard Ba'athist Party member back in that country. But when some Baathists split off in the 1980s, he joined the faction associated with the Iraqi leader Saddam Hussein. Eventually, he abandoned it in disgust and chose to live in southern Turkey. For the past 20 years, he has lived away from politics. But now, the trim, mustachioed man is once again involved with the work of the Ba'athists. This time, however, he is tending to the Syrian party's many victims. He doesn't want to provide his real name but, over the past few weeks, he has become, in his own words, "Abu al-Forsan," Arabic for the "father of the knights," knights being the closest word in English to a term that refers to men of great courage, honor and integrity. His knights are the 70 or so wounded Syrians now receiving care in Turkish hospitals in this southern border city. "They are my children," the man says. "If I don't see them every day, I feel like I have wronged them." He is not unknown to the regime in Damascus, which he says, recently sent one of his brothers over from the family hometown of Aleppo in northern Syria to warn him against helping the wounded protesters. "My brother came for just a few hours, just to deliver the message that they know what I am doing and they want me to stop." But Abu al-Forsan won't stop. At 11 a.m. one morning, he was barreling up the stairs of a hospital in Antakya, carrying bags of plastic slippers and knock-off Nike attire to distribute to the Syrian patients. He entered a room with two young men from the northern Syrian town of Jisr al-Shughour. One had a bullet still lodged in his right eye; the other, who was also shot in the face, had a patch over his left eye. "Uncle, it's good to see you," the man with the patch said. "Tell me, what's the news from Jisr? I can't understand the news here, it's all in Turkish!" The former Ba'athist recounted what he knew, before turning to the other young man, pulling his cell phone out of his back pocket, dialing a number, and handing it to him. "We found your brother. He's in a camp. Here, talk to him." The man was overjoyed. For many Syrians  hurt, frightened and alone in a foreign country  Abu al-Forsan is the closest thing to family they have. The hospital visits benefit him too. He says they are a chance to right what he considers the wrongs of being in the Ba'ath Party. "I was 26 years old when I joined. I thought it was about pan-Arabism. I believed its motto of 'unity, freedom and socialism,'" he says. "It was all lies. There was no freedom. The only place I'd dare open my mouth was at the dentist." He left Aleppo in 1981, initially crossing the northern Syrian border into Turkey, where he says up to 300 rebel Syrian Ba'athists and their families had sought refuge. Syria and Iraq were deeply hostile neighbors for decades, in an inter-Baath struggle that had as much to do with the personalities and egos of the countries' two leaders, Iraq's Hussein and Syria's Hafez al-Assad (the father of the current Syrian President Bashar al-Assad), as it did with political ideas. "Everybody wanted to be a leader," Abu Forsan says laughing, referring to the rebel Ba'athists in Turkey. "So I distanced myself from them all." After six months, he left for Iraq, where he lived a lavish expenses-paid lifestyle, courtesy of Saddam's faction. But the party soon ended when Abu al-Forsan says he was asked to join his host's fight against Iran (Iran and Iraq fought a bloody eight-year war that ended in 1988). "I refused, so they cut off my expenses, and cancelled my Iraqi passport. They gave me a three-month travel document." Abu al-Forsan returned to southern Turkey, where with its ethnic Arab population and close blood ties to northern Syria, he felt he wouldn't be so isolated from his home country. He married a Turkish woman from a border village, and began work as a textiles trader. Still he ached for the family he left behind. "Eight of my uncles in Syria died, my younger brother died, my grandfather and eventually my parents. I didn't get a chance to see any of them," he says. Mohammad, 23, knows the pain of a family split by political oppression, and the physical pain of wounds he sustained in an anti-government protest on May 20 in the Syrian village of Maarat al-Naaman. The construction worker was shot in the left shin, and in the left upper arm by Syrian security forces. He has been bed-ridden in a Turkish hospital for two weeks now. Pins protrude from his left leg, and an IV drip tries to kill the infection circulating in his blood. He's in a bad way, but his green eyes light up and he quickly smiles when Abu al-Forsan walks into his room. "May God bless you and keep you," he tells the older man. Mohammad's father, Abu Moen, stands to greet his son's visitor. An exiled member of the banned Muslim Brotherhood, Abu Moen travelled from Yemen to be at his son's bedside. He has several children in Syria he hasn't seen for years. (The Muslim Brotherhood, like most parties, is illegal in Syria.) "My heart is burning to return home," Mohammad says. "My dream is that one day my father will be able to return and our family will be reunited." "God willing, that will happen soon," Abu al-Forsan says. It was Abu al-Forsan's Turkish in-laws, who live close to the Syrian border, who first alerted him to the wounded Syrians being ferried across the border. "I got a call from a relative who said 'it looks like the Syrians have started arriving,'" he says. "I went to the main hospital immediately to receive them." He offers his countrymen more than just clothing, news and a friendly face speaking their language. He has also posted men in and around the hospitals to ensure that strangers, especially Syrian strangers who may be regime loyalists, do not harm the patients. "We are very afraid for the young men, and they are afraid as well," Abu al-Forsan says. "When they first arrive they are suspicious of me too, and they have every right to be. They think I might be moukhabarat," he says, referring to the secret police. "I tell them, 'Son, I am from Aleppo. I suffered because of the big dog, you are suffering because of his puppy. We are all the same.'"